"Racecourse" redirects here. For other uses, see Racecourse (disambiguation). For other uses, see Race track (disambiguation). A race track (or "racetrack", "racing track" or "racing circuit") is a facility built for racing of vehicles, athletes, or animals (e.g. horse racing or greyhound racing). A race track also may feature grandstands or concourses. Racetracks are also used in the study of animal locomotion. Some motorsport tracks are called speedways. A racetrack is a permanent facility or building. Racecourse is an alternate term for a horse racing track, found in countries such as the United Kingdom, India, Australia, Hong Kong, and the United Arab Emirates. Race tracks built for bicycles are known as velodromes. Circuit is a common alternate term for racetrack, given the circuit configuration of most race tracks, allowing races to occur over several laps. A race course, as opposed to a racecourse, is a non-permanent track for sports, particularly road running, water sports, road racing, or rallying. Many sports usually held on racetracks also can occur on temporary tracks, such as the Monaco Grand Prix in Formula One. There is some evidence of racetracks being developed in several ancient civilizations. The most developed ancient racetracks were the hippodromes of the Ancient Greeks and the circuses of the Roman Empire. Both of these structures were designed for horse and chariot racing. The stadium of the Circus Maximus in Ancient Rome could hold 200,000 spectators. Racing facilities existed during the Middle Ages, and there are records of a public racecourse being opened at Newmarket in London in 1174. In 1780 the Earl of Derby created a horse-racing course on his estate at Epsom; the English Derby continues to be held there today. 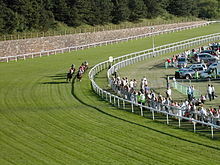 Racecourses in the British Isles are based on grass, known as turf tracks. In the United States, the race tracks are dirt. With the advent of the automobile in the late nineteenth/early twentieth century, racetracks were designed to suit the nature of powered machines. The earliest tracks were modified horse racing courses. Racing automobiles in such facilities began in September 1896, at Narragansett Park in Cranston, Rhode Island. The Indianapolis Motor Speedway was opened in August 1909. 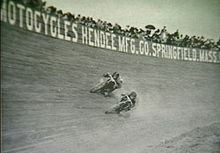 Beginning in the early 1900s, motorcycle races were run on high, banked, wooden race tracks called board tracks. During the 1920s, many of the races on the AAA Championship circuit were run on such board tracks. Modern racetracks are designed with spectator safety being paramount, following incidents of spectator and track marshals fatalities. These often involve run off areas, barriers, and high fencing. Some racetracks offer little in the way of permanent infrastructure other than the track; others incorporate spectator facilities such as grandstands, hospitality or facilities for competitors, such as pit lanes and garages, paddocks and stables. Several racetracks are incorporated into larger venues or complexes, incorporating golf courses, museums, hotels, and conference centres. Some racetracks are small enough to be contained indoors, for sports such as motocross, cycling, and athletics. Many racetracks are multi-use, allowing different types of sport on the same track, or incorporating many tracks in one venue. Commonly running tracks are incorporated within general use or soccer stadiums, either permanently visible or covered by stands or pitches. Many horse and motorsport tracks are configurable, allowing different routes or sections. Some venues contain smaller tracks inside larger ones, with access tunnels and bridges for spectators. Some racetracks incorporate a short course and a longer course which uses part of the shorter one, usually the main straight, such as Brands Hatch. The Le Mans road race venue is centred on a smaller permanent circuit within its complex. Race tracks are primarily designed for road racing competition through speed, featuring defined start-finish lines or posts, and sometimes even a series of defined timing points that divide the track into time sectors. Some sports merely measure endurance, or how long a competitor can race. Race tracks can host individual or team sports. Racetracks can feature rolling starts, or fixed starts, with associated equipment (starting blocks, cages, wheel traps etc.) They invariably feature a pit lane, and usually timing equipment. Some race tracks are of an oval shape, often banked, which allows almost universal spectator views or high speed racing (cycling, stock cars), but are often criticised for lack of excitement; these predominate in North America. A famous one is Nardò where high-speed manufacturer testing often takes place, and the Indianapolis Motor Speedway. Some oval tracks are variations on an oval shape, for practical reasons or to introduce varying difficulties such as Talladega (a tri-oval). Most race tracks have meandering circuits with many curves, chicanes and changes in height, to allow for a challenge in skill to the competitors, notably motocross and touring car racing - these tend to predominate throughout most of the world, but especially in Europe. 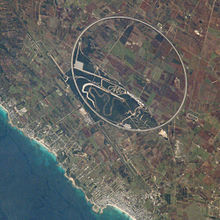 Photograph from space of Nardò Ring in Italy, it is 12.5 kilometres (7.8 mi) long and is perfectly round – the image was taken at an angle making it appear elliptical. Flatter meandering motorsport courses are sometimes called 'road circuits', originating in the fact that the earliest road racing circuits were simply closed-off public roads. True road circuits are still in use, e.g. the Australian GP has been run in Adelaide and continues to be in Melbourne on regular city streets. The most famous of these are the Monaco GP, and the Spa-Francorchamps circuit in Belgium. 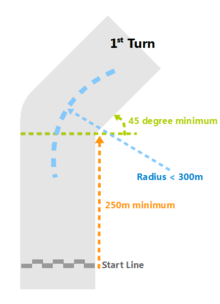 Some racetracks are specifically configured in a long straight, namely drag racing. Some races will be held only over the straight portion of a track (some horse racing and sprint athletics). The boom in motorsport flared after WW2, when many airfields particularly in Great Britain were left without further use. The most famous British track - Silverstone - is one after being a WW2 Class A Airfield, as are Castle Combe and Goodwood Circuit's. The long runways were perfect for drag strips such as at Santa Pod Raceway, and circuit layout usually creatively combined parts of the runways and the surrounding perimeter taxiway. This type of track also appears on the popular motoring show Top Gear, which is filmed at Dunsfold Aerodrome, in Surrey, England. In 2015, Maurice Hamilton published "Grand Prix Circuits: Maps and statistics from every Formula One track", which covered over 70 Grand Prix racing circuits. It provided maps, pictures and a brief history of each track. Each course map is accompanied statistics including circuit lengths, lap records and even the names of corners and straights. ^ "2015 IFMAR Yatabe Worlds: Astrogate". Archived from the original on 4 March 2016. Retrieved 29 December 2015. ^ Maurice,, Hamilton,. Grand prix circuits : history and course map for every formula one circuit. London. ISBN 9780008136604. OCLC 951146691. Wikimedia Commons has media related to Racing venues. AudioTrackGuides.co.uk Audio walkthroughs of motor racing circuits, for use with games. This page was last edited on 20 December 2018, at 13:04 (UTC).